Make your child the star with Presto the Magician! Presto offers a basic, deluxe, and ultimate birthday package and even a birthday party magic class! Presto’s Summer reading programs and “just-for-fun” comedy magic shows are a guaranteed favorite at libraries! Bring Presto to your school for fundraiser kickoffs, incentive assemblies, reading week, or just for fun! 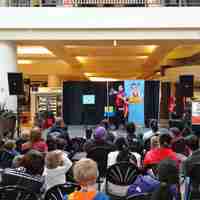 Presto offers educational programs, as well as “just-for-fun” magic shows. Presto performs at a variety of venues throughout the Pacific Northwest, including company parties, mall events, grand openings, and more! Kevin (aka Presto) first got interested in magic when he was eight years old and watched his uncle perform magic at a family reunion. After convincing his parents to buy him a magic set, and quickly learning all the tricks, he was performing shows for his neighborhood out of his garage! When he was 14, Kevin started performing for events in the Seattle area, including the Seattle Children’s Hospital, where he performed with his brother, Evan. “I loved seeing how laughter took the sadness out of the children’s faces,” Kevin says. Kevin’s love of magic has continued to this day (basically, he never grew up), where he performs full-time at events throughout the Pacific Northwest. 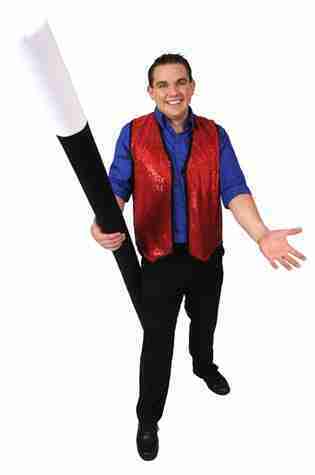 As a magician in Portland, Presto currently performs nearly 300 shows each year! “Somehow, as we grow up, and mature, and become more responsible, somehow we lose that magic. It seems that as our brain grows, they shove out the imagination. So-called logic and reason take the place of wonder, amazement, and dreaming big! Check out the videos below to see all the fun! Looking for magic shows for adults? You’ll want to check out Kevin Allen – Portland’s Favorite Comedy Magician! or by filling out the form below!